In the Keys, a medical airlift can cost more than $50,000. Or, if you live or own property in the Keys, it only costs what your insurance company pays. It all depends on which helicopter provides the ride. A Key West woman tells her story about getting airlifted - then getting the bill. "I wanted to go on the land ambulance, but they said that it was too dangerous for me, that I had to take the helicopter," Engelson says. The only helicopter she says she was told about was LifeNet, which is based at Lower Keys Medical Center. It's operated by a private company. Engelson was airlifted to Jackson Memorial Hospital in Miami. "I spent a week in the hospital and when I came back, I got my mail and I had a bill from LifeNet for $54,999," she says. "I was just blown away." Her insurance paid $8,000. She was on the hook for the rest. While she was fighting the bill, she learned about Trauma Star. That's the air ambulance service owned and operated by Monroe County government. Monroe County commissioners were getting a lot of complaints from people who were placed in the private, more expensive helicopter. So they sent everyone in the county stickers that say "TRAUMA STAR FIRST OPTION." The stickers are intended for driver's licenses and insurance cards. For people who live or own property in the Keys, Trauma Star collects what it can from insurance — and that's it. There's no out-of-pocket cost. Monroe County Commissioner David Rice says the county started the service to make sure people in the Keys — residents and tourists — could get to trauma centers quickly. Before Trauma Star began in 2001 with a military surplus Huey helicopter, airlifts from the Keys required a helicopter dispatched from the mainland. "Trauma centers are marvelous places. If you get there alive, you'll probably leave there alive," Rice says. "The getting there part is what we wanted to enhance." Original projections called for the service to be used 12 times in a year. It surpassed that in the first month, says Capt. Andrea Sutherland, who oversees the EMS side of Trauma Star operations. The Monroe County Sheriff's Office supplies the pilots. In 2014, Trauma Star had 385 calls and it's on track to exceed that this year, Sutherland says. "I think we actually saw a decline for awhile when the tourism slowed down with the whole economy and everything," Sutherland says. "Now it's picking back up. Summer, spring break time, we have more trauma calls. Then in the winter, when the snowbirds are down, we have more interfacility calls with the heart attacks and the strokes and things like that." 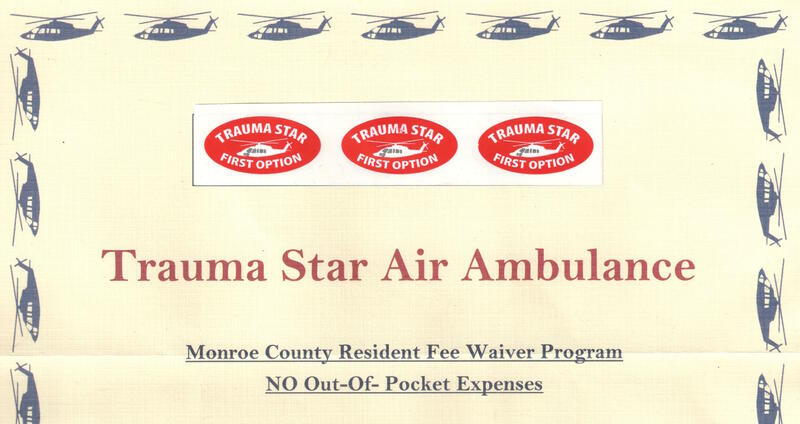 Even though Trauma Star has been operating for 14 years, Rice says he was still getting a lot of calls from people upset that they didn't know about the option — or were unable to tell the ER they wanted to use Trauma Star instead of the private helicopter. "When you go into an emergency room, you're not the best communicator in the world," Rice says. "Suddenly you find you're flying on somebody's helicopter. At that point in time, you may not even care whose helicopter. It's only when you get home, having survived, and then you have to survive the shock of getting that bill in the mail." Capt. 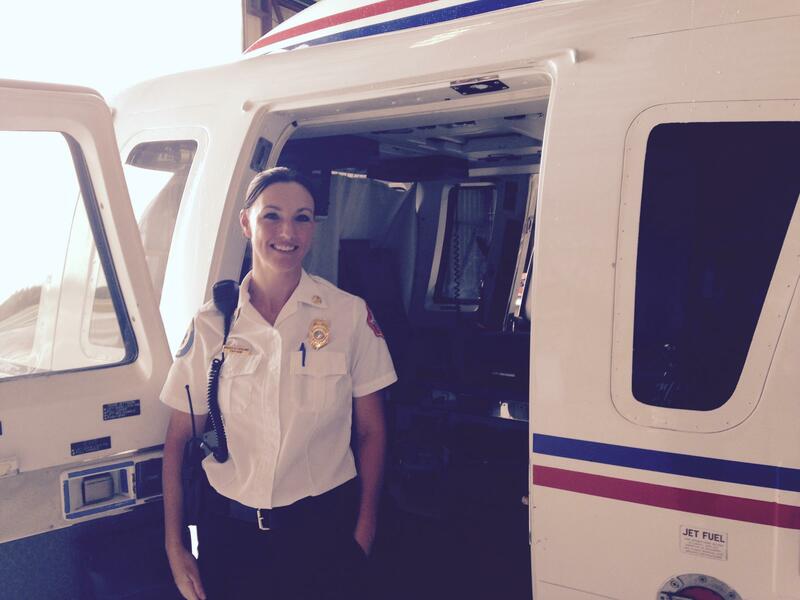 Andrea Sutherland oversees the EMS side of Trauma Star operations. She's seen every kind of trauma in the Keys, from spearfishing incidents to people who fell off the top of the fort at the Dry Tortugas. So last summer, the county sent out red stickers that read "Trauma Star First Option" to everyone who lives in the Keys. The stickers are intended for driver's licenses and insurance cards in case a patient can't communicate after an accident. Rice says the stickers seem to be working. "I haven't had a call in some time from a resident or property owner complaining that they unknowingly got stuck on the wrong helicopter with the big bill," he says. "It used to happen with disturbing frequency." A spokeswoman for Air Methods, the company that owns LifeNet, wrote in an email that the company works with insurance companies and patients on bill payments. "Insurance companies often do not cover air medical transportation in a way that protects their members, and we are left, as many providers are, in the middle to work with the patient," Christina Brodsly wrote. The company has a "special consideration application" that can bring down costs in individual circumstances. A spokesman for Lower Keys Medical Center says the decision about which helicopter to use is made by doctors "in the interest of providing the highest quality care and complying with federal and state regulations related to the treatment and transfer of patients." Factors leading to the decision include "the level of service required, how quickly patients need to be transported and the proximity of helicopters to the hospital," wrote Randy Detrick, spokesman for Lower Keys Medical Center, the hospital in Key West where Life Net is based. Trauma Star is based in Marathon, 50 miles up the road. Engelson fought the balance of her bill for four months and says eventually LifeNet settled for what it got from the insurance company. She's now an evangelist for Trauma Star. "Every time I'm in the grocery store and checking out anywhere, and people have their wallets open," she says, "I ask them if they have the Trauma Star sticker on their IDs and insurance card."